One of the most popular islands in the Canaries is Tenerife, the perfect destination for a lazy beach holiday. 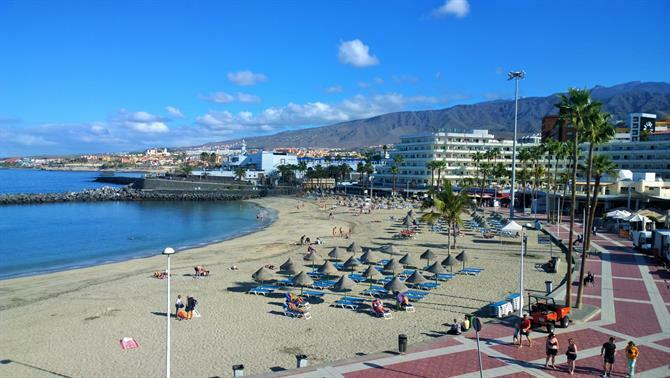 Especially the southern coast of the island, where popular holiday destinations like Playa de las Americas, Los Cristianos and Costa Adeje are located, a blessed bunch of powdery, picture-perfect beaches one after the other. 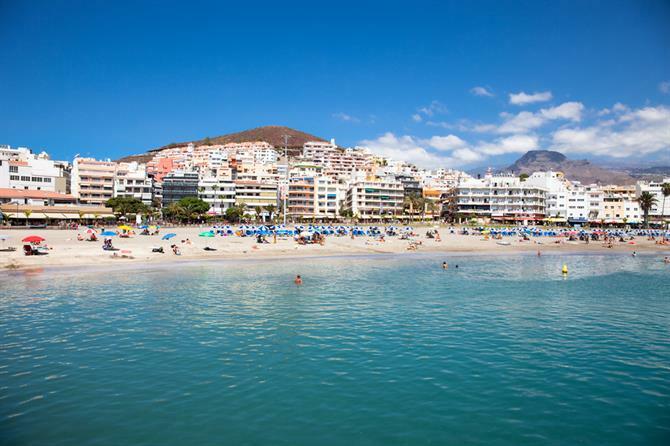 Plan a holiday in Tenerife and hit the bathtub-warm waters of the Canary Islands and discover a few of the most stunning beaches in Spain, accredited by millions of happy holidaymakers. 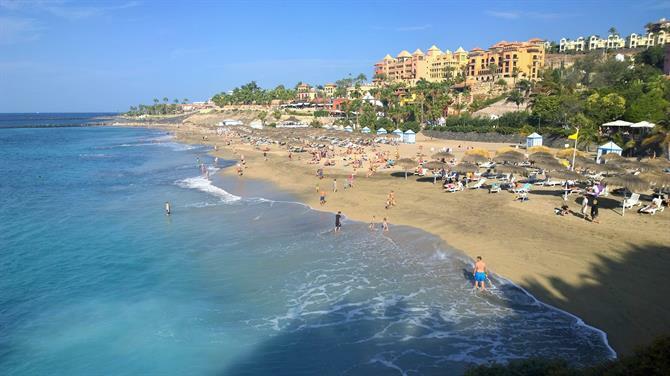 Playa El Duque is located in the trendy Costa Adeje holiday area, a short walk away from the charming fishing village of La Caleta. The area around the beach is packed with spectacular five-star hotels, fancy restaurants and luxury brand boutiques that can satisfy the most demanding shop-a-holics. Luckily the beach is free for everyone to use. Playa El Duque is without a doubt one of the best beaches Tenerife. Turquoise water, big alluring waves and golden sand attract both travellers and locals. Playa El Duque has all the services needed for spending a lovely day at the beach. You'll find public showers, toilets, sunbeds, restaurants and supermarkets here. If you get bored of sunbathing, you can go for a refreshing walk on the cliffs just left of the beach. Here you can also find some shade for that sun-exposed skin. When you continue to walk towards Playa de las Americas from El Duque, you will find two lovely beaches right next to each other: Playa Fañabe and Playa Torviscas. This area is one of the best places to stay in Tenerife. There are numerous cafés, bars, restaurants, souvenir shops and supermarkets right in front of the two-level beach promenade. During the night, people come here to enjoy the live music, relaxed atmosphere and those amazing sunsets that Tenerife is so famous for. You can also find a small waterpark on the beach for kids. Bigger water lovers can get wild and wet with the watersports selection also available. Continue to stroll down towards Las Americas from Fañabe, you'll find the next beach on our list: Playa La Pinta. Playa La Pinta may not be the biggest beach around, but it is popular due to its location right next to one of the biggest ports around, Puerto Colón. Most of the best boat and watersport tours start here and you can buy tickets at the entrance of the port. There is also a small shopping centre with cafés, restaurants and travel agencies in front of the harbour. Here you can take part in the popular dolphin watching tour, go for a jet-ski trip or rent a whole sailing boat for your entourage. Playa Troya is located in front of the busiest part of Las Americas. This beach is very popular and can get crowded during the busiest holiday season. Playa Troya is located near the most popular cafés, bars and restaurants in Las Americas. This area gets busy at night when the party-people head here to enjoy some of the best nightclubs and bars in the south of Tenerife. You can find two popular beach clubs in La Troya: Monkey Beach Club and trendy Papagayo Beach Club. Long breakwaters protect La Troya from biggest waves and the beach is quite safe for smaller children. You can find all necessary services nearby and if you are up for some adrenaline packed fun under the sun, you can head to the neighbouring beach La Honda, where you can catch your first surfing waves. 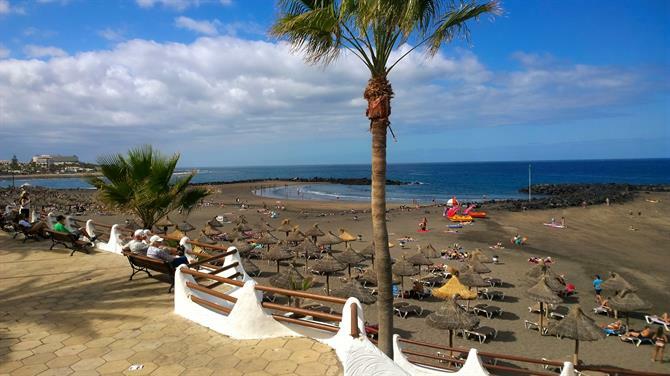 Playa El Camisón is a charming beach lined by green area and palm trees right on the border of Playa de las Américas and Los Cristianos. This is one of the best beaches in Tenerife for families; the beach is quite shallow and breakwaters keep bigger waves at bay. Palm trees offer some shade from the burning sun and you can enjoy a picnic in the green area without getting your toes all covered in sand. There is also a lovely beach restaurant on the left-hand side of the beach. Perfect for enjoying that refreshing glass of Sangria while watching the sun go down. A strong favourite among holidaymakers is Playa Las Vistas which is almost a kilometre long, 80 metres wide and the area is tucked up with popular cafes, restaurants and bars. 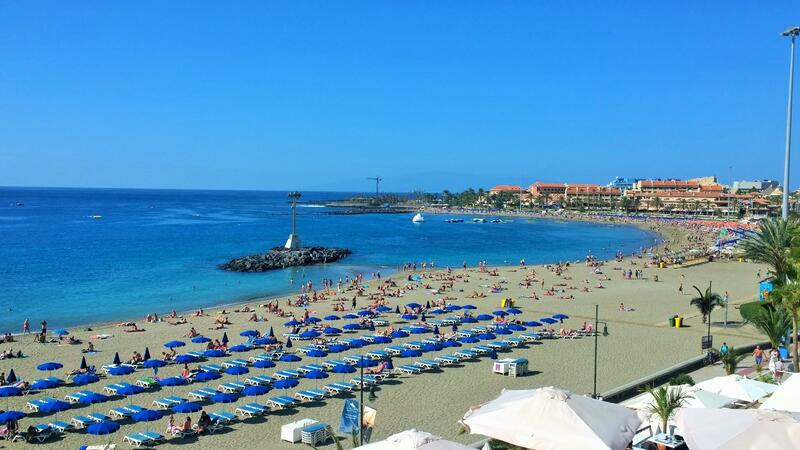 Las Vistas is also a very popular family beach in Tenerife, due to its huge size and shallow waters. During late hours, the area of San Telmo in front of the beach gets crowded with happy holidaymakers who want to party like there is no tomorrow. Or if you are looking for a place to enjoy that colourful pre-dinner cocktail watching the famous sunset of southern Tenerife, San Telmo is your place. The beach of Los Cristianos was one of the first beaches in the south of Tenerife back in the '60s when the travel boom started on the island. This small beach is popular among families, who come here to enjoy a quieter day at the beach. The Los Cristianos beach is charming, there are many small fisherman boats bobbing in the shore and you can enjoy some of the best seafood delicacies of the island in the restaurants right in front of the beach. Los Gigantes is a small, charming seaside town on the west coast of Tenerife. Discover what this must-see destination has to offer you! 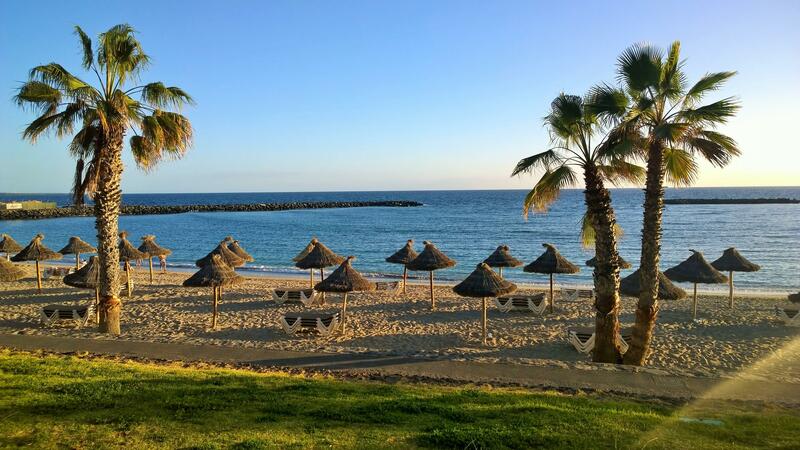 Discover the best selection of beaches in southern Tenerife. 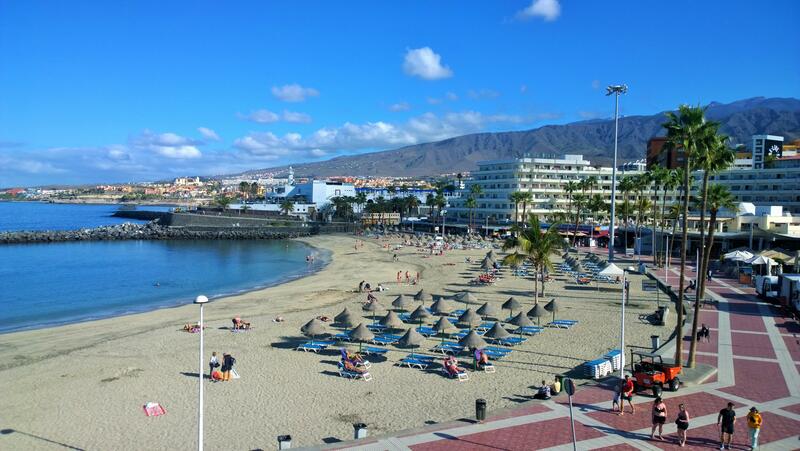 Welcome to the beach hotspot of the Canary Islands, Vamos a la playa! Discover Tenerife South´s postcard-perfect fishing villages and towns and experience the authentic and tranquil settings that they have to offer! Luxury or budget? Read our guide to the various upmarket and cheap and cheerful resort areas that make up Costa Adeje on Tenerife.